Kick off your visit on the 2nd (Sat): explore the world behind art at Museum of Fine Arts. On the next day, appreciate the extensive heritage of Louisburg Square, admire the masterpieces at Otis House, steep yourself in history at The Old Manse, then contemplate the long history of Orchard House, and finally stroll the grounds of Mount Auburn Cemetery. For ratings, where to stay, traveler tips, and other tourist information, go to the Boston online visit planner . Paris, France to Boston is an approximately 11-hour flight. The time zone difference moving from Central European Time (CET) to Eastern Standard Time (EST) is minus 6 hours. Traveling from Paris in March, expect Boston to be little chillier, temps between 7°C and -1°C. Wrap up your sightseeing on the 3rd (Sun) to allow time to travel to New York City. The Metropolitan Museum of Art and Ellis Island are good opportunities to explore the local culture. 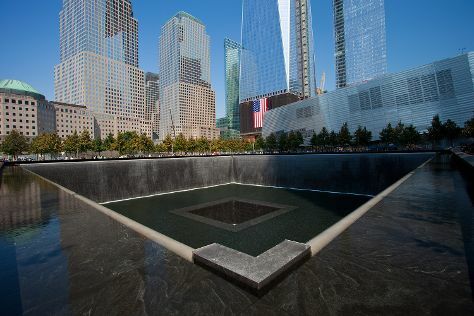 Get some historical perspective at 9/11 Memorial and St. Patrick's Cathedral. There's lots more to do: take in the pleasant sights at Central Park, take a stroll through Times Square, ponder the world of politics at New York City Hall, and make a trip to Statue of Liberty National Monument. To find more things to do, maps, and more tourist information, read our New York City trip app . You can do a combination of flight and bus from Boston to New York City in 3 hours. Alternatively, you can fly; or drive. Expect a bit warmer temperatures when traveling from Boston in March; daily highs in New York City reach 11°C and lows reach 1°C. Finish your sightseeing early on the 6th (Wed) to allow enough time to travel to Arches National Park. Mother Nature kept reaching for red when she painted Arches National Park's 2,000 sandstone arches, resulting in one of the country's more distinctly shaped and colored landscapes. Start off your visit on the 7th (Thu): tour the pleasant surroundings at Fiery Furnace, make a trip to Wolfe Ranch, then explore the striking landscape at Turret Arch, then tour the pleasant surroundings at Double Arch, and finally explore the striking landscape at Double Arch. Find out how to plan Arches National Park trip without stress by asking Inspirock to help create an itinerary. Getting from New York City to Arches National Park by combination of bus, flight, and car takes about 10.5 hours. Other options: do a combination of bus and flight; or drive. The time zone difference moving from Eastern Standard Time to Mountain Standard Time is minus 2 hours. When traveling from New York City in March, plan for somewhat warmer days in Arches National Park, with highs around 19°C, while nights are about the same with lows around 0°C. Finish your sightseeing early on the 7th (Thu) so you can drive to Monument Valley. Monument Valley is a region of the Colorado Plateau characterized by a cluster of vast sandstone buttes, the largest reaching 1000ft above the valley floor. Start off your visit on the 8th (Fri): take in the dramatic natural features at Monument Valley Navajo Tribal Park, trek along Wildcat Trail, and then explore the fascinating landscape at Monument Valley Navajo Tribal Park. For maps, photos, traveler tips, and tourist information, read Monument Valley journey planner . Drive from Arches National Park to Monument Valley in 4 hours. Expect slightly colder weather when traveling from Arches National Park in March: highs in Monument Valley hover around 16°C, while lows dip to 0°C. Finish your sightseeing early on the 8th (Fri) so you can drive to Page. On the 9th (Sat), take in breathtaking views at Antelope Canyon, explore and take pictures at Horseshoe Bend, then have fun at Gunfighter Canyon, and finally look for all kinds of wild species at Paria Canyon Wilderness Area. Get ready for a full day of sightseeing on the 10th (Sun): surround yourself with nature on a nature and wildlife tour. To find photos, ratings, other places to visit, and more tourist information, you can read our Page trip maker app . Traveling by car from Monument Valley to Page takes 2.5 hours. In March, Page is somewhat warmer than Monument Valley - with highs of 21°C and lows of 6°C. Finish your sightseeing early on the 10th (Sun) to allow enough time to drive to Grand Canyon National Park. Get outdoors at Grand Canyon South Rim and South Kaibab Trail. On the 13th (Wed), hike the day away at Bright Angel Trail. Next up on the itinerary: trek along Rim Trail, see the interesting displays at Kolb Studio, and explore the stunning scenery at Inner Canyon. To see photos, maps, more things to do, and other tourist information, you can read our Grand Canyon National Park trip planner. You can drive from Page to Grand Canyon National Park in 2.5 hours. Plan for little chillier temperatures traveling from Page in March, with highs in Grand Canyon National Park at 16°C and lows at -5°C. Cap off your sightseeing on the 13th (Wed) early enough to travel to Zion National Park. On the 14th (Thu), take in breathtaking views at Zion's Main Canyon, then tour the pleasant surroundings at Angel's Landing, and then explore the striking landscape of Observation Point. For maps, where to stay, ratings, and other tourist information, use the Zion National Park vacation builder site . Use the Route module to find suitable travel options from Grand Canyon National Park to Zion National Park. Traveling from Grand Canyon National Park in March, expect Zion National Park to be somewhat warmer, temps between 20°C and -1°C. Finish your sightseeing early on the 14th (Thu) to allow enough time to drive to Bryce Canyon National Park. Kick off your visit on the 15th (Fri): explore the striking landscape of Peek-A-Boo Loop. Discover how to plan a Bryce Canyon National Park trip in just a few steps with Inspirock's itinerary builder. You can drive from Zion National Park to Bryce Canyon National Park in 3 hours. Plan for a bit cooler temperatures traveling from Zion National Park in March, with highs in Bryce Canyon National Park at 11°C and lows at -7°C. Finish your sightseeing early on the 15th (Fri) so you can drive to Las Vegas. Kick off your visit on the 16th (Sat): see the interesting displays at The Mob Museum, get a taste of the local shopping with The Strip, and then admire the local landmark of Bellagio Fountains. Get ready for a full day of sightseeing on the 17th (Sun): see the interesting displays at The Neon Museum, take in nature's colorful creations at Bellagio Conservatory & Botanical Gardens, and then explore the stunning scenery at Red Rock Canyon National Conservation Area. To see ratings, maps, more things to do, and more tourist information, use the Las Vegas vacation builder app . Traveling by car from Bryce Canyon National Park to Las Vegas takes 5 hours. Alternatively, you can do a combination of car and flight; or do a combination of car, bus, and flight. The time zone changes from Mountain Standard Time (MST) to Pacific Standard Time (PST), which is usually a -1 hour difference. Prepare for much warmer weather when traveling from Bryce Canyon National Park in March: high temperatures in Las Vegas hover around 27°C and lows are around 13°C. Finish your sightseeing early on the 17th (Sun) so you can travel to Los Angeles. Take a break from the city and head to Oak Canyon Nature Center and Kenneth Hahn State Recreation Area. The Getty Center and Hollywood Forever Cemetery are good opportunities to explore the local culture. You'll find plenty of places to visit near Los Angeles: Disneyland Park (in Anaheim) and Santa Monica Mountains (in Santa Monica). To find maps, more things to do, and other tourist information, you can read our Los Angeles sightseeing planner . You can fly from Las Vegas to Los Angeles in 4 hours. Other options are to drive; or take a bus. In March, daily temperatures in Los Angeles can reach 27°C, while at night they dip to 14°C. Wrap up your sightseeing on the 20th (Wed) to allow time to drive to Sequoia and Kings Canyon National Park. Kick off your visit on the 21st (Thu): make a trip to Grant Grove, trek along Big Baldy, and then trek along Buena Vista Peak Trail. Here are some ideas for day two: stroll through Lakes Trail in Sequoia National Park, then delve into the lush surroundings at Giant Forest, and then take a memorable drive along Generals Hwy. For photos, traveler tips, ratings, and tourist information, go to the Sequoia and Kings Canyon National Park sightseeing planner. Getting from Los Angeles to Sequoia and Kings Canyon National Park by car takes about 5.5 hours. Other options: do a combination of flight, bus, and car. Plan for slightly colder nights when traveling from Los Angeles in March since evenings lows in Sequoia and Kings Canyon National Park dip to 9°C. Cap off your sightseeing on the 22nd (Fri) early enough to catcht the bus to Yosemite National Park. Escape the urban bustle at North Dome and Nature Center at Happy Isles. Spend the 24th (Sun) on the water with a fishing tour. There's lots more to do: identify plant and animal life at McGurk Meadow, take in the dramatic natural features at Glacier Point, and take your sightseeing to a higher altitude at Cathedral Beach Picnic Area. To find ratings, where to stay, other places to visit, and other tourist information, refer to the Yosemite National Park day trip website . Traveling by bus from Sequoia and Kings Canyon National Park to Yosemite National Park takes 7 hours. When traveling from Sequoia and Kings Canyon National Park in March, plan for a bit cooler days in Yosemite National Park, with highs around 13°C, while nights are cooler with lows around -5°C. Wrap up your sightseeing on the 25th (Mon) to allow time to drive to San Francisco. Get in touch with nature at Alcatraz Island and Twin Peaks. Get some cultural insight at Fisherman's Wharf and de Young Museum. The adventure continues: take in the views from Golden Gate Bridge, engage your brain at Exploratorium, explore the galleries of SS Jeremiah O'Brien, and see what you can catch with a fishing tour. To find reviews, photos, where to stay, and tourist information, use the San Francisco route planner. You can drive from Yosemite National Park to San Francisco in 4 hours. Alternatively, you can do a combination of car and flight; or do a combination of bus and flight. Traveling from Yosemite National Park in March, you will find days in San Francisco are somewhat warmer (21°C), and nights are much hotter (11°C). Wrap up your sightseeing on the 28th (Thu) to allow time to travel back home.